WASHINGTON — Summer gardens are flourishing, but so are the populations of pesky weeds and critters that can damage all of your vines and veggies. Before you throw in the towel on your tomatoes and thyme, Kathy Jentz, editor and publisher of Washington Gardener Magazine, has some tips on how to protect your garden this summer. All the recent rain the D.C. region is great news for gardens — but also for weeds. “It’s a weed explosion out there; it’s a jungle,” Jentz said. Most weeds aren’t aggressive enough to flat-out harm a garden, Jentz explained, but they do hog space and steal resources that could otherwise go to the fruits, veggies and flowers you planted. What’s the best way to get rid of them? While reaching for a bottle of weed killer may be tempting, Jentz said a better approach, both for you and the environment, is to skip the gym and spend a few hours hand-pulling the weeds. She recommends waiting until after a good rain to get to work, since the water loosens the soil, making it easier to get the entire weed in one tug. Plugging in a podcast or getting lost in a book-on-tape will make the time pass quickly. Just be sure to set an alarm if you have other tasks on your to-do list: Jentz said weeding is one of those activities where it’s easy to zone out once you get going. “It’s the type of work where you can visibly see progress, and a lot of people in their jobs today don’t have that type of job where it goes from bad to good … so some people, once they start weeding, they really get into it and then half a day, a full day could get away from you,” she said. For weeds with long taproots, Jentz recommends cutting the weed at the soil level often. This deprives the roots of the chlorophyll it needs, and doesn’t disturb the weed seeds in the soil. Finally, when you’ve cleared an area, be sure to mulch with a leaf compost, bark or other organic material to retain moisture in the soil and block any remaining weed seeds from growing. The rabbit population is on the rise in the D.C. area. 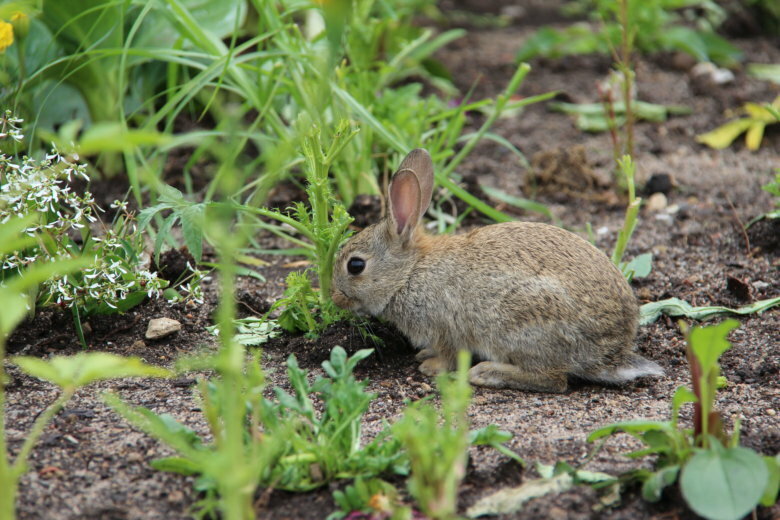 Jentz said while the little bunnies are adorable, “they can be devastating to a garden” — especially green bean plants, which seem to be a favorite among the furry set. “They eat them down to the nub every time they emerge,” Jentz said about the stems and leaves of the green bean plant. If you do opt for chicken wire, be sure to push it all the way into the soil “because rabbits can burrow and dig a little bit,” Jentz said. “So make sure it does have soil contact all the way around because those little baby bunnies can squeeze into the tiniest areas,” she added. Chicken wire can also help keep deer from destroying a garden, but don’t be surprised if it requires a few repairs from occasional damage. Jentz has seen plenty of deer try to kick in fencing and chicken wire in order to get the goods on the other side. “When you’re hungry, you’re hungry, and when you see a juicy strawberry, you’re not going to stop until you can get to it,” Jentz said. Natural sprays are another option when it comes to deer. There are sulfur-based “foul-smelling sprays” on the market (just be warned that they are foul-smelling to humans and deer), as well “predator urine sprays” from animals like wolves and coyotes. “That’s to indicate to the deer that there’s a predator in the area, so either of those sprays are totally fine on any of your plants and totally safe around any other animals,” Jentz said. Planting deer-tolerant plants is another way to make your garden less attractive to intruders. Oils in a lot of the Mediterranean herbs — lavender, rosemary, mint — are too strong for deer. Jentz said if you have a garden plot that you don’t want to spray or fence in, you can plant a perimeter of mint or even marigolds, which have a similar effect. “If they encounter the mint first, they’ll know, ‘This zone doesn’t look too good; I’ll go over to another zone,’” Jentz said. Finally, installing a motion-activated sprinkler (Jentz mentioned Scarecrow, which shoots a sharp stream of water when an intruder trips its laser sensor) is another great way to repel unwanted animals without hurting them. Just make sure to turn if off before you head out to collect the morning paper.